I just started listening to Admiral Fallow's album Boots Met My Face. I see constant pictures and stories in my head while listening, but it has been hard to nail down what it is about these songs that I am reacting to. 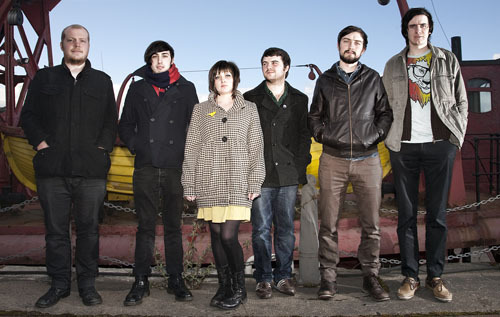 Known as Brother Louis Collective until last year, Admiral Fallow is a group from Scotland formed in 2007. They recorded this album in 2009, and "Squealing Pigs was released in Scotland early in 2010. The entire album was re-released as Admiral Fallow a year later. I am at a lake in northern Wisconsin. The lake reflects the gray sky above, and I know that various life forms are awaking and scurrying about in the trees that shroud the lake's edges, but for now, there is no sound. I barely notice the quiet because my head is full, screaming full, of the voices of my family. My evaluations of their life choices. My reluctance to make decisions that will better my own life. I could be anyone, standing anywhere, but this is who I see when I imagine someone being moved by the song "Squealing Pigs." That's Sarah Hayes providing counterpart harmonies throughout the album to lead singer/songwriter Louis Abbott's. Hayes also plays the flute in that haunting, vulnerable, I-will-let-you-hear-me-take-breaths way. Double bass, clarinet, guitar, and drums round out the ensemble and deliver a heartfelt, at times melancholy, at other times brutally honest sound to match the album title, which by the way comes from a depiction of a beating Abbott received as a kid. Compared to Wilco, compared to Decemberists, influenced by Elbow and Springsteen, Admiral Fallow headlined in the UK earlier this year and also enjoyed a slot at the US South By Southwest festival. BBC2 actually did a documentary outlining all of the Scottish bands at this year's festival, entitled "Scotland Rocks at SXSW". The hour-long program also featured The Twilight Sad, Kid Canaveral, and Rachel Sermanni. Check out more about the program here. Currently playing a few gigs here and there in the UK, watch festival schedules as they are announced for the '12 and bet money you will see this name.